The major Dutch daily, Volkskrant has published a cartoon depicting an Israeli soldier wearing sunglasses and the Jewish Star of David on his back while a frightened, unarmed Palestinian stands against a wall. 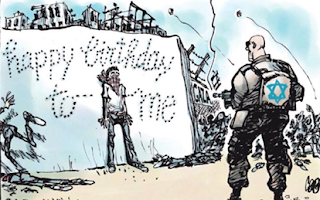 The Israeli soldier is shown firing a barrage of bullets spelling out “happy birthday to me” on the wall behind the Palestinian with bullets going through the Palestinian. The Simon Wiesenthal Center denounced the cartoon as demonizing Israel and its soldiers as blood thirsty murderers.